This past October, Stefanie De Adder, Environmental Project Coordinator at Western, along with members of EnviroWestern’s team, hosted an electronic waste (e-waste) drive on campus. The drive was held in the Labatt Health Sciences Parking Lot during National Waste Reduction Week. For one week, students, staff and faculty at Western, as well as members of the London community, were encouraged to bring in their old e-waste to be disposed of in a safe, environmentally friendly way. The proper disposal of e-waste is important in order to reduce space taken up in landfills, prevent greenhouse gas emissions and to protect the environment. E-waste can contaminate water supplies, air and soil because it contains toxic materials. These materials include lead, mercury, and arsenic, which can be very harmful to humans and wildlife. The proper disposal of e-waste not only allows for the protection of humans and wildlife, but also allows for items to be broken down into base components and properly recycled or reused. 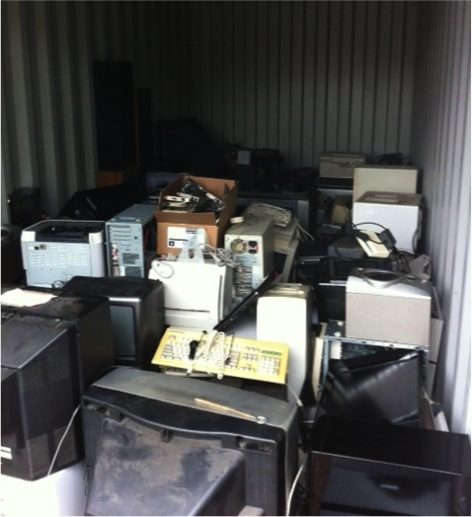 The event was a huge success, bringing in over 4000 pounds of e-waste during the week. This event showcases yet another way that Western strives to be the best when it comes to sustainability, especially with regards to waste diversion. Keep an eye out for posters, tweets and emails about Western’s next e-waste drive. Clear out some space from your home and dispose of your waste in an environmentally-friendly way! For more information on e-waste recycling in London, visit: http://www.london.ca/d.aspx?s=/recycling_and_composting/electronics_recycling.htm.